While the Indian left has been somewhat disoriented after the poor show of the Left Front in recent popular elections, leading to end of almost quarter of century government in West Bengal, it would appear that this massive turn out with red flags indicates a mood swing against the neo-liberal policies pursued by both the Congress and Bharatiya Janata Party (BJP) governments. The agrarian distress, which is a direct result of these policies and peasant anger is supposed to be the reason behind the unseating of BJP governments in Rajasthan, Madhya Pradesh and Chhattisgarh states. Of course this did not result in any electoral advantage for the left parties, but it did enable the centrist Congress to form governments in those states. The agrarian crisis has been brewing for a long time and has been much written about. It is the urban industrial crises that has not drawn enough attention. The nation-wide general strike of workers has therefore forced attention to the plight of the working class. We will look at the special features of this strike and then examine the changing condition of the workers which may explain the massive participation in this strike. The term ‘General Strike’ refers to strike action by workers across an industry (industry-wide), or a territory or region or across the entire country (nation-wide). It was conceived as both a symbolic act to draw attention, or to force a government to accept specific demands or to precipitate a revolutionary crisis leading to the seizure of power. Working class theoreticians like Rosa Luxemburg argued that general strikes were possible only when a large mass of unorganised workers (who formed the bulk of the working class) came out in support of the strike demand, and could not succeed just by the efforts of organised workers and their unions. The larger political import of the general strike as a political tool emerged in the wake of general strikes in Belgium (1886-93) and Russia against absolutism and in support of democracy in both 1905 and 1917. Luxemburg who studied this phenomenon argued that it was largely marked by spontaneity and seamless movement between political and economic demands. While she was reluctant to see it as having the potential to bring about a revolution, it was an essential part of the schooling of workers into revolutionary politics. Luxemburg somehow missed out on the organisational fall out of the general strikes of Russia, namely the Soviets of workers’ deputies which were to play a critical role in the subsequent revolutions in 1917. Anarchists and Syndicalists generally favoured general strikes as a means of achieving both short term economic and long term political goals. Socialists were in general reluctant to use general strikes as a weapon till the Russian revolution established its importance in working class tactics. Perhaps the reason was that the mass of the workers were not unionised and encouraging autonomous action will lead to breakdown of working class organisational discipline. If we were to look back at this rather dated history of the idea, two broad issues need underlining. Firstly, the relation between the unionised and unorganised workers and secondly the relation between economic, political and revolutionary agenda of the working class. The weapon of general strike has been used in recent decades for both political and economic purposes, especially to resist neo-liberal policies that the nation states have been falling prey to. The 2002-3 General Strike (Oil Strike) of Venezuela against the policies of Chavez provides an interesting example. Chavez sought to use the oil revenues from abroad to fund his social security policies which in turn meant both intensification of oil production and increased controls over the mining industry. As the oil prices declined resulting in mounting financial crunch a wave of anti-Chavez movement rose. At this juncture the workers of the oil industry went on an indefinite general strike to force Chavez to demit office or order fresh elections. Chavez adopted strong measures like dismissing tens of thousands of oil workers and managerial staff, firing on demonstrators, etc. The complete stoppage of oil supply crippled exports and precipitating a foreign exchange crisis and steep decline in GDP. Finally the strike was defeated, and Chavez too was able to win a popularity referendum with the support of the urban poor who continued to gain from his social security policies. This pattern of using General Strike by trade unions to force the government to accede to political demands can be seen in Guinea where the workers struck work to force the autocratic president to concede demands for devolution of power. Of course there were several economic demands like cutting down the prices of fuel, increase in wages and clamping down on police corruption, but these were not pressed for in the interest of the main objective of appointing a prime minister of the union’s choice with real powers. The strike called by the United Trade Union of Guinean Workers a centre of the country’s trade unions, lasted for nearly two months in January and February 2007. The workers faced severe repression, but did not budge and forced the president to negotiate and appoint a prime minister of the union’s choice. Europe has been seeing a number of strike actions against neoliberal cuts in wages, social security, working hours, retirement age etc. A Europe wide strike against such reforms proposed for November 2012 failed as it could not get the requisite support from trade unions of different countries. However, unions in individual countries have been going on strike to stall the proposed ‘reforms’. In a General Strike in Belgium in 2016, thousands of public sector workers took part in a 24-hour national strike against budget cuts, changes to working hours and a rise in the retirement age. These strikes came in the wake of similar strikes in France over controversial labour reforms. Even as this essay is being written the workers of Belgium (February 2019) are on a general strike against the planned government cap on wage increases to 0.8% over the next two years and raising the retirement age. The strike has brought the country to a virtual halt with all transport including air traffic crippled and all institutions including schools shut down. The pattern that emerges is as follows: an alliance of central trade unions at the national level supported and egged on by opposition political parties target the apex of the political system to seek a change. It may be successful or otherwise depending upon the support it will get from the unorganised masses. In both these instances, the strike was indefinite and cannot be described as symbolic. They were a real ‘fight to the finish’ accompanied by intense negotiations with the government. A general strike then is a political act with the intention of putting pressure on the state to either gain political ends like change of government or to negotiate changes in wage regime and social security on a national scale. 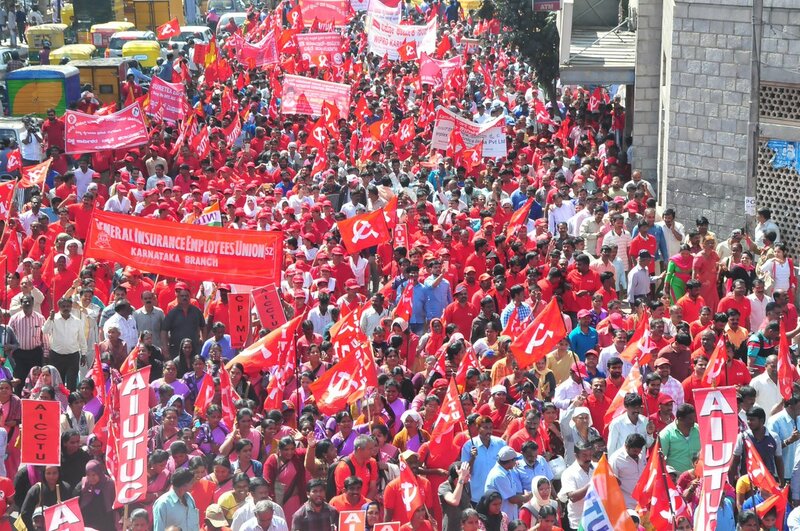 General strikes in India have had a paradoxical character of involving massive numbers of workers for symbolic protests rather than effective negotiations. The two recent strikes in 2016 and 2019 have been called the largest General Strikes in human history involving about 150 to 200 million workers (about half to two thirds of the entire population of the USA). Even though such estimates are accompanied by some degree of scepticism and doubt, the fact remains that Indian General Strikes manage to touch huge numbers compared to the strikes in other countries. Despite this the impact of Indian strikes has been rather limited, mostly confined to symbolic expression of working class displeasure. A part of the reason lies in the demographics – the fact that nearly half of the Indian working population consist of small farmers and unorganised agricultural workers (43%), and that manufacturing employs less than one fourth (24%) and the fast growing ‘service’ sector employs the rest (33%). The impressive term ‘service sector’ in reality is a euphemism for the vast reserve army of labour engaged in petty production and casual labour. About 97% of the Indian workforce is employed in what is called the ‘informal sector’ and not covered by any formal social security system. The trend has been towards decline in dependence on farming and massive entry of dispossessed farmers into the urban or migrant informal sector. Even sectors where the production units are formally registered, employ very large numbers of casual workers without any social protection. Most of these workers also fall outside trade union organisation. The presence of such a large reserve army of labour engaged in production in the informal sector seriously limits the impact of strike action by the segment of unionised workers. For the most part the general strikes called by the trade unions impact only the minority of organised workers and at the most the formally registered firms in which unorganised workers work. The vast production sphere of agriculture or services which together contribute 70% of the GDP remain unaffected. An important exception of course are the public sector banks which have strong unions very sensitive to neo-liberal policies. In this context the two successive general strikes of 2016 and 2019 have sought to work towards a broad based unity of the entire working class and especially towards drawing in the informal sector workers and the contract workers within the so called formal sectors. The central trade unions had called for a nation-wide general strike on 2nd September 2016 pressing for a charter of 12 demands. The Narendra Modi government has effectively refused to negotiate with the unions over this charter and it remains the basis of the two day General strike of 8-9 January 2019. What is significant about this charter is its focus on issues concerning the entire working class especially those in the informal sector. The very first demand relates to controlling prices of essential food items, effective implementation of food security act and strengthening of the Public Distribution System (PDS) of food items. The second demand relates to employment generation given the fact that the neo liberal growth has virtually created no jobs, even as more and more distressed farmers are entering the employment market. The third demand relates to raising minimum wages from the present dismal levels to what is considered a decent ‘family wage’ or Rs. 18,000/ per month (Rs.700 per day). The fourth demand relates to the practice of employing workers on casual basis (contract labour). The charter demands an end to the contract labour system and ensuring same wages and same benefits (social security) as regular workers for similar work. The Fifth and the sixth demands seek to stall the proposed reforms to the existing labour laws depriving the working class of its hard won rights. The seventh, eighth and the ninth demands seek to extend social security cover like pension, provident fund, gratuity, bonus, Employees State Insurance Scheme (ESIC, health insurance) etc. for all workers including those in the informal sector and a minimum pension of Rs 6000/ per month per person. The charter also opposes the attempts to privatise social security and utilisation of provident funds for speculation in the stock markets. The tenth demand relates quick registration of trade unions and removal of obstacles in the way of formation of trade unions and their recognition by the management. Given the fact that the vast majority of workers are unorganised, and the emerging firms are very inimical to workers’ organisation, this demand assumes great significance. The last two demands oppose the increasing privatisation of public sector undertakings including the railways and insurance. Meanwhile the government went ahead with its plans for restructuring the labour laws to facilitate freedom for hiring and firing workers, making organizing difficult, opening a range of non-standard employment possibilities. It is proposed to amalgamate 44 existing labour laws into four labour codes in the name of streamlining and simplification, but in effect creating the framework of a neo liberal labour regime. Social security provisions too are being interfered with to dismantle the existing ESIC and provident fund schemes to open them up to the play of market forces. In view of the continued impasse and refusal of the government to discuss with the unions the charter of demands, the National Convention of Trade Unions met in Delhi on 28th September 2018 and decided to call for a two day General Strike on 8-9th January 2019. It was attended by ten central unions and a large number of independent federations of workers and employees. The Convention noted with dismay an avalanche of anti worker measures taken by the government and also its anti peasant policies leading to farm crises. It also drew attention to the impact of the divisive and communal policies of the party in power which was using the government to pursue its agenda. One central union and some splinter unions opted out of the National Convention and the general strike- the Bharatiya Mazdoor Sabha (BMS, the trade union front of the Rashtriya Swayam Sevak Sangh or RSS) . In December 2018, the BMS along with the breakaway factions of the TUCC, INTUC and NFITU have formed what they call a “non-political” trade union front, called the Confederation of Central Trade Unions (CONCENT). The government has chosen to consult this break away front instead of convening the National Labour Conference or talking to the Central Trade Unions. It may be noted that the BMS even though it is affiliated to the ruling BJP, is opposed to many of the policies of the government which are obviously inimical to its rank and file members. However it does not want to be associated in its actions with other Central Trade Unions which are affiliated to anti-BJP political parties and would like to use the strike to mobilise workers against the present government in the general elections. It may be recalled that during the previous Congress led government, the INTUC affiliated to the Congress chose to participate in a general strike in September 2010, which had been called by all central trade unions together. This unity of trade unions was broken by the BMS which sought to form a rival centre of trade unions. The working class which spoke with one voice in negotiating with the government now stands divided, by this action of the BMS. By most accounts, the strike was great success, not only because most of the workers affiliated to the Central Trade Unions went on strike, but a large number of workers otherwise unorganized and engaged in the informal sector or in contract work, struck work. This included a large number of women working in government schemes referred to above, who constitute some of the most vulnerable sections of Indian working class. They came out with a steely resolve to fight for dignity in their work. While many have questioned the dramatic figure of 200 million workers on strike, it may not be far off the mark. Of course at present it is not possible to verify and arrive at any correct estimate of numbers, but reports from the field are indeed impressive. We will be recounting some of these reports in the section below. Before we turn to the details of the strike in the different states, it is important to put this strike in perspective. This is happening in the backdrop of continued mass demonstrations of farmers across the country, who constitute 40% of the working population of the country. This leftward turn of working people of India holds much hope in the dark times initiated by the Communal, jingoist, casteist and authoritarian BJP government. The strike in Assam was unprecedented. All the tea gardens were closed. Refineries were closed. Workers, both permanent and contract workers picketed and demonstrated outside several refineries. Workers along with fraternal mass organisations of peasants, agricultural workers, students, women etc. held rail roko (railway stoppages) all over the state. The strike received massive response from the working class in Bihar. Road transport was totally paralysed. Scheme workers, construction workers, beedi workers participated in the strike and held huge rallies in Samastipur, Khagaria, Darbhanga, Jamui, Begusarai and other districts. Roads were blocked in Samastipur, Katihar etc. The state bandh (shut-down) called by the Left parties in support of the strike, on the issues of peasants and agricultural workers and against the deteriorating law and order situation in the state, on January 9 was total. The industrial workers and employees in the National Capital Region Delhi joined the strike in a big way. The industrial areas of Okhla 3 phases, Naraina, Mayapuri, Mongolpuri 2 phases, Udyognagar, Nangloi, Wazirpur, GT Karnal Road, Badlhi, Rajasthanpuri, Bhorgarhetc, were totally closed. Workers struck work and marched in processions which culminated in rallies in different industrial areas. Around 2000 to 3000 workers participated in each rally. Teachers and students of Delhi University and Jawaharlal Nehru University joined the strike en masse. Universities were closed. Gujarat, the home state of Prime Minister Modi, witnessed such a joint strike of workers for the first time in many decades. The trade unions took up extensive joint campaign. Engineering workers in Baroda, Surat, Bhavnagar, Rajkot, Junagarh, Ahmedabad, most of them not organised under any trade union joined the strike in large numbers. Despite the threats of victimisation from the BJP government in the state, anganwadi employees and ASHAs joined the strike and held massive demonstrations in most of the districts in the state. For the first time, mid-day meal workers joined the strike. BMS campaigned extensively against the strike calling it a ‘political strike’. Despite this, anganwadi employees affiliated to the BMS union in three Integrated Child Development Services Scheme (ICDS) projects in the state joined the strike and also the demonstrations held on the occasion. Big rallies were held in eight cities – Ahmedabad, Surat, Rajkot, Junagarh, Baroda, Anand and Palanpur. Around 3000 to 8000 workers participated in each. The modern industrial area of Gurgaon in Haryana witnessed a good response of the workers to the strike. Hero Honda declared three days’ holiday. Except Maruti, most of the big industries including Honda remained closed. Workers in all the smaller industries in the area struck work and joined rallies. A huge joint rally of industrial workers was held on January 8. Workers in the government sector, roadways and unorganised sector like brick-kiln, forest, village chowkidar, construction etc, joined the strike in a big way. Strike in Rajasthan in different industries, both in the organised and unorganised sector has been quite noticeable despite severe police repression on the striking workers in the MNC dominated industrial area in Neemrana. There have been numerous demonstrations and processions by the striking workers along with others throughout the state. <>The scheme workers, Mahatma Gandhi National Rural Employment Guarantee Act workers, hydel project workers as well as industrial workers in Himachal Pradesh participated in the strike. Huge rallies with mostly women workers were held in several district headquarters. Despite the difficult political situation in the state, unorganised sector workers and scheme workers participated in the strike in thousands in Jammu and Kashmir. Interstate bus services were off the road. A procession with the participation of scheme workers, railway contract workers, construction workers, coal mine workers, hydro project workers, vendors, middle class employees etc was held in Jammu. Protest demonstrations were held in almost all the districts in the Kashmir valley. The industrial areas of Bokaro, Ranchi, Adityapur, Gamharia in Jharkhand were almost closed due to the strike. The pharmaceutical industry was closed. Beedi workers and stone quarry workers in Pakur, Sahebganj and Chatra and Bauxite workers in Lohardaga were in total strike as were the workers in the copper mines and industry. Over 30 lakh workers, including industrial workers, public sector, government, bank, insurance, Bharat Sanchar Nigam Ltd. scheme workers and unorganised sector workers, participated in the strike in Karnataka. There was total strike in public road transport; autos were off the road in Bengaluru. All the permanent workers in multinational corporations Toyota Kirloskar, Volvo buses and trucks, Coca Cola etc. and also in private sector major industries participated in the strike. Strike was total in the industrial areas of Bengaluru, Mysuru etc. Despite the large scale disturbances sought to be created by the BJP against the entry of women of all ages to the temple in Sabarimala in Kerala, a joint campaign was extensively conducted all over the state with an effort to reach every nook and corner of the state. The strike was total. Workers and members of other mass organisations picketed trains at 32 points. Train traffic was disrupted and several trains had to be cancelled. Trivandrum, Cochin and Kozhikode airport ground handling staff were on strike causing disruption of flights. Because of the campaign, people extended support to the strike. There were very few passengers in the buses and trains. Thousands of workers have gathered at the 483 strike centres which have been opened across the state. These centres were active for the entire 48 hours duration of strike throughout day and night. In addition to the total participation of anganwadi employees, ASHAs and mid-day meal workers in the strike in Madhya Pradesh, thousands of workers in private industries, particularly cement industry participated in the strike. Strike was total in all the cement units where Centre of Indian Trade Unions (CITU) had affiliated unions. In addition it was near total in Hitech and 75 percent in Heavy Engineering Works. Workers in the industrial clusters in Indore, Neemuch etc., and the contract workers in Navin Flourine International Ltd. joined the strike. Though most of the road transport workers are not organised under any trade union, the extensive campaign by the CITU state committee resulted in massive participation of road transport workers with transport being seriously affected in 22 districts in the state, where no passenger buses could run. In Bhopal, 70 per cent of the buses could not operate and 80 per cent of city buses were stopped in depots. Even under government pressure, only 15-20 percent buses were operated. Strike in the coal mines in the state was also massive. In Chhattisgarh, Balco witnessed 95 percent strike, Hirry and Nandini Mines 90 per cent and in coal mines, more than 85 per cent workers joined the strike. Anganwadi workers and mid-day meal workers’ strike was to the tune of 60 percent. Participation of beedi workers, rice-mill workers, loading-unloading workers in the mandis (market towns) was above 60 per cent. In the central government offices, banks and insurances, strike was above 90 per cent. In Bhilai Steel Plant, the strike was partial. Workers of Holcim, and other cement factories, especially the contract workers struck work in Chhattisgarh. With the total participation of the transport workers in BEST (Bombay Electricity Supply and Transport) in the strike, bus services were off the road in Mumbai. There was total strike by workers in multinational companies like BOSCH, CEAT, Crompton, Samsonite etc. Thousands of permanent and contract workers of Reliance Industries also joined the strike. The industrial areas in Pune, Nashik, Aurangabad, Kolhapur, Ichalkaranji were seriously affected due to the strike. Highways were blocked in many places. A massive rally planned jointly in Solapur could not be held as police denied permission because of the prime minister’s visit to the city on that day. Manipur bore a deserted look due to the massive strike. Vehicular traffic was totally stopped; educational institutions shut down and examinations were postponed. All the major markets were closed. Road blocks and demonstrations were held in many places. There was a bandh like situation in Odisha. Road transport was totally off. Strike was 80 percent in cement and engineering industries. The strike in the public sector units like National Aluminium Company Ltd., Port and Dock and Indian Oil was over 80 percent. In the mining sector, strike is almost total. Scheme workers totally participated in the strike. Unorganised sector workers held rastaroko (road stoppage) and rail roko in several places. All political parties including the ruling Biju Janata Dal, except the BJP supported the strike. In Agartala in Tripura, despite the use of force, BJP government could manage to get only 30 percent of the shops opened and around 30 percent of buses to operate. Almost same has been the situation in many other districts of the state. Teachers attended schools but there were no students. The main participants in the strike in Uttarakhand were the anganwadi employees and mid-day meal workers in addition to the government employees. In some places, hotel workers, contract and outsourcing workers, work charged employees also participated. However, rallies were held in all the districts. East India Pharmaceuticals, Britannia and other big industries in Kolkata were closed due to the strike in West Bengal. There was total strike in the jute mills with all except one being closed as well as in the engineering industry despite the terror by the ruling party Trinamool goons. There was no loading in trucks. Passenger and goods transport in the state were practically off roads. There was total strike in the industrial areas in 24 Parganas, Hooghly, and Howrah. Tea garden workers in Jalpaiguri, Alipurduar and Dinajpur were on strike and participated in rastaroko demonstrations. There was good strike in coal and steel plants in the state. 60 percent of the permanent workers in Calcutta port were on strike. 70 percent of street vendors in Kolkata joined the strike. Universities and colleges remained closed with lecturers and students joining the strike. Despite the attack unleashed by police and Trinamool Congress goons on the striking workers in the state, it was heroically resisted by the workers along with democratic people from all walks of lives throughout the state. Police arrested hundreds of activists and leaders including Anadi Sahu, general secretary of the CITU state committee. Participation of workers in the major industries in this strike all over the country was quite high compared to the earlier strikes. The overall participation of strike in the coal industry was around 70-75 percent. Production and dispatch almost collapsed. Both permanent and contract workers joined the strike in almost all the big projects including the outsourced projects. Thirty lakh electricity workers, employees and engineers in the power sector joined the strike across the country at the call of the National Coordination Committee of Electricity Employees and Engineers. The strike in the oil sector was unprecedented, particularly in Assam. Employees in various refineries in Assam joined the strike and picketed offices. Oil workers of three out of the four unions in Kochi refinery joined the strike despite the management getting a court order banning the strike. Contract workers participated along with the permanent employees. Overall, strike in the petroleum sector has been substantive in the eastern, north-eastern and southern India while it was partial in western and northern part. There was good strike in the steel industry with near total strike in Vizag steel, Salem steel and Bhadravati. In Rourkela steel plant, permanent workers joined the strike and picketed the plant and strike was around 50 per cent on the whole. Contract workers joined the strike en masse. The strike in other steel plants viz., Bokaro, Bhilai and Durgapur was partial. Strike was partial in the ports as some of the major unions did not join the strike in some of the major ports. But cargo handling was affected in Paradip, Tuticorin, Kolkata, Haldia, Visakhapatnam and Cochin ports. Road transport was highly affected creating a bandh like situation in many states in the country. An estimated 3.5 crore transport workers and small owners participated in the strike. The strike in the road transport sector was total with the participation of workers in public and private passenger and goods transport including autos in Kerala, Bihar, Odisha, Assam and Arunachal Pradesh. Strike was over 80 per cent in West Bengal. Strike had serious impact in Punjab, several districts of Karnataka, Maharashtra, and Jharkhand. Construction workers participated in the strike in a big way as well as in the demonstrations in the entire country. Plantation workers, tea, coffee, rubber, joined the strike en masse in Assam, West Bengal, Kerala and in large numbers in Tamil Nadu and Karnataka. In addition to the industrial workers, the strike saw massive participation of employees in the service sectors also. Women scheme workers in all states including where the trade union movement was weak, participated not only in the strike but in the demonstrations all over the country. They lent visibility to the strike even in places where no other trade union existed. Strike among insurance employees was near total all over the country. Lakhs of bank employees including the officers in the Regional Rural Banks, Cooperative Banks, Reserve Bank and National Bank for Agriculture and Rural Development (NABARD) participated in the strike at the call of the All India Bank Employees’ Association (AIBEA) and Bank Employees’ Federation of India (BEFI). Around 13 lakh central government employees joined the strike across the country as per the call given by the Confederation of Central Government Employees and Workers. The strike was total in the postal and income tax departments. In addition employees of Audit and Accounts, Civil Accounts, Atomic Energy, Geological Survey of India, Customs and Central Excise, Survey of India, Botanical Survey of India, Central Ground Water Board, Postal Accounts, Indian Space Research Organisation (ISRO), Printing and Stationery, Indian Bureau of Mines, AGMARK, Central Government Health Scheme (CGHS), Medical Stores Depots, Film Division of India, Indian Council for Medical Research (ICMR), Indian Council of Agricultural Research, Central Food Processing Laboratory, Census Department, National Sample Survey Organisation (NSSO), Defence Accounts, Rehabilitation Department, Central Public Works Department (CPWD), Institute of Physics, LNCPE, Sree Chitra Tirunal Institute of Medical Sciences, Canteen Employees, Employees’ Provident Fund Organisation (EPFO), Passport Department, and various other autonomous and scientific research institutes participated in the two days’ strike. The strike among central government employees was total in Kerala, West Bengal, Tamil Nadu, Odisha, Telangana, Andhra Pradesh, Chhattisgarh, Jharkhand, Haryana, Assam and other North Eastern states including Tripura. In all other states 60-80 per cent employees participated in the strike. State government employees in many states joined the strike in a big way. While the strike was 90 per cent in Kerala, around 80 per cent of state government employees in Haryana and several other states joined the strike. In Uttar Pradesh over 60 per cent employees were on strike while it was 40 per cent in Himachal Pradesh. Strike in BSNL was total in Kerala, West Bengal and the north eastern states and partial in other states. In many states, retired employees, including EPS 95 pensioners extended solidarity and support to the strike by joining the demonstrations and rallies. Huge demonstrations and rallies were held in all the states in the industrial centres and district headquarters with the participation of thousands of workers in each. Industrial workers, middle class employees, scheme workers and unorganised workers participated in these in large numbers. Thousands of workers were arrested across the country including in Assam, Tamil Nadu, and West Bengal etc. It would appear that the participation of workers from all sectors, both organized and unorganized, formal and informal was massive. This is an important pointer towards increasing disenchantment with the neo-liberal regimes and the present BJP led government in particular. A brief summary of the distress of the working people may be useful to explain this disenchantment. Ever since India launched into the neo liberal policy regime, it meant the closure of old large scale factories and massive expansion of the small manufacturing outfits which circumvented the labour laws. Most workers rendered unemployed turned to the informal sector for survival, doing odd jobs, running petty shops etc. The newly emerging industries and service sector firms were geared to international market and susceptible to its pressures. During the same phase the phenomenon of primitive accumulation progressed apace in the agrarian and forest zones driving millions of poor farmers, agricultural workers and tribal people to towns seeking jobs. Land alienation and urbanization classically went hand in hand. The urban formal sector understandably was unable to absorb the workers flooding the towns. These workers in turn desperate for work were employed as contract workers replacing the regular organised workers and their employment went up and down with the rhythm of the markets. Contract labour became the order of the day, a labour force without any formal status, recognition or rights. A highly volatile capital market, which required rapid combination labour and capital and even more rapid movement towards de-combination led the capitalists to call for ‘flexible labour laws’ and an end to the old welfarist labour regime. Workers employed here today and dismissed tomorrow, fell back on informal work for survival. One of the most devastating work of the Modi government was to demonetize currency notes in the hope of pushing the informal sector to function through formal money markets and banks. This severely undermined the functioning of the informal sector, which incidentally employed women on a very large scale. This attack was followed a year later by a clumsy implementation of new indirect tax regime which mainly sought to bring the informal sector within the tax net. The combined effect of the two measures was to precipitate a severe crisis in the informal sector. The neo liberal onslaught had another weapon in its arsenal, that of privatization and commercialization of some of the essential public services, communication (mobile phones), transport, water supply, and above all education and health care. Privatisation of these public services increased the cash expenditure of the working people forcing them to look for funds. It is here that the Banks stepped in with offer of credit to the informal workers. A third major thrust of the Modi government was to bring the entire working population in the banking net through the Jan Dhanyojana. The banks and other institutions offered loans to informal workers especially women, otherwise denied any credit support. The urban and rural poor were now trapped in the debt cycle with a far more powerful and impersonal creditor. The net effect of this debt enmeshing was to coax the unorganised workers to work more for less wages, so as to pay the inordinate interest rate being charged for lending to resourceless poor. Now comes the last straw, even as the neo liberal policies sought to depress agricultural prices in favour of industrial and service goods, it allowed the energy prices to spiral up leading to both increase in input costs for agriculture and general price rise for the urban poor. We need to look at the present protests and strike actions in the light of these developments. The ground for further radicalization of the workers and poor peasants is ready. 9. Removal of all ceilings on payment and eligibility of bonus, provident fund; increase the quantum of gratuity. 12. No FDI in Railways, Insurance and Defence. Click here to return to the September 2018 index.